Bert Carson - writer: New Year, New Game, How Will You Play? Maybe you have to be a FreeCell fan to appreciate this illustration and, since this post isn't about FreeCell, but rather life, both in general and in particular, let's refocus. Now the illustration is to the point - a question and a choice. Actually, there are three choices you must make before restarting the game. 1. Do you want to play again? 2. If you choose "yes," you must choose "the same game" or a "new game." And then comes the choice not written, but understood. "Will you play the restarted game the same way you played the game you just lost?" 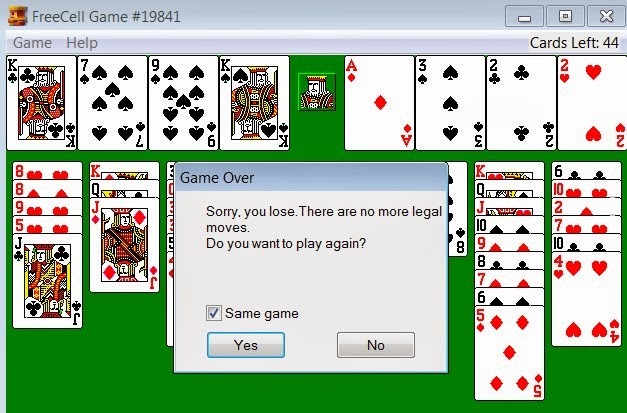 If there is a way to cheat at this old XP version of Freecell, I don't know how to do it. However, there is a way to clear a game you know you are about to lose without having the loss register in your statistics. If you haven't discovered the way, it is simply to reboot your computer. To use a real life analogy, it's the same as severing yourself from an old life and leaving town to start over in a place where no one knows or cares if, or how many times, you've rebooted. Today, with a fresh new calendar looming dead ahead, let's take a look at the three Freecell questions again. First a note: These questions only pop up when you've selected restart. If you don't desire different results than than you are currently achieving, stop reading here and have a great year. However, if a restart is in order, here are the choices offered by both Freecell and life. 1. Do you want to play again? I don't know about you, but when I've lost or I'm facing a sure loss, I always want to play again. So I answer "Yes" and move to the next choice. 2. (Do you want to play) Same Game? For the same reason, I chose to to play again, I always choose, "same game." I'm not going to quit on a loss, and I'm not going to give up on a particular game. And now comes the question that Bill Gates didn't put on the pop up menu; 3. Do you intend to continue to play the way you have been playing? 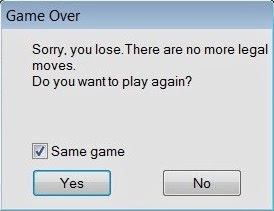 There have been many times when I wished that had been a pop up choice, because without thinking, I select "yes," then "same game," and five, or ten, or fifteen moves into it, realized I was in the exact same position as before, and I was going to lose exactly the way I just did. 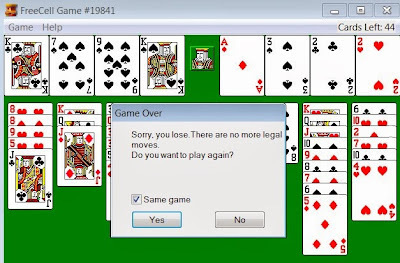 Life is like Freecell. As long as there is life in you, you have the option to restart. However, even if you reboot, you will ultimately lose if you play the way you have been playing (it's the old insanity definition in new clothes—if you do the same thing you will achieve the same results). 1. Do I want to play again? 2. Do I want to play the same game again? 3. Will I play the same way I played in 2013? Happy New Year - may it be your best yet.